Middletown coach Rob Smernoff addresses his team Thursday. 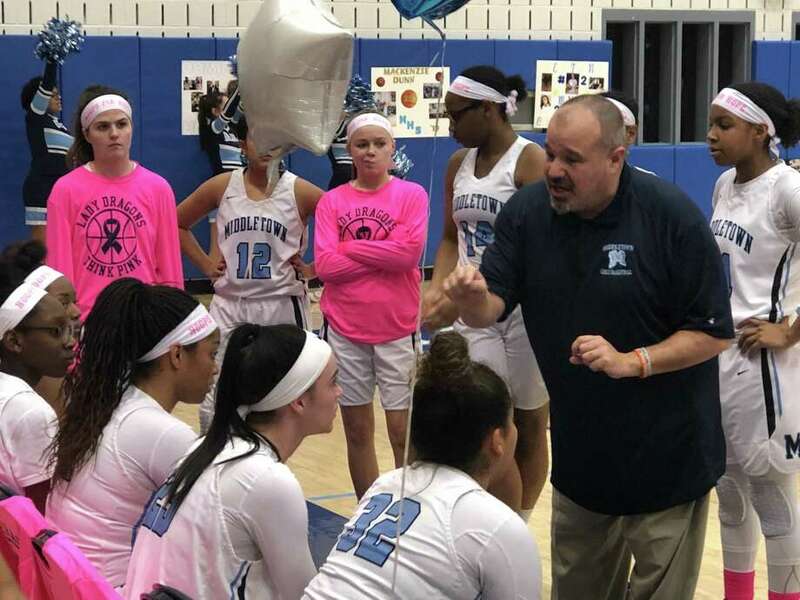 MIDDLETOWN — Thursday was a night for Middletown’s girls basketball team to recognize and appreciate its seniors and look forward to what its underclassmen will provide in the coming seasons. Sophomore guard Kya Mayo scored in double figures for the sixth straight game and senior forward Mackenzie Dunn had 11 points in Middletown’s 52-40 CCC South-Colonial girls basketball win over Platt at LaBella-Sullivan Gymnasium. The victory was the Blue Dragons’ third straight and it gave them a chance to be among the 16 qualifiers in the coming CCC tournament, but they have to win at Berlin on Monday and get some help to get in. Senior forward Dominique Highsmith added seven points for Middletown and freshman guard Tyah Pettaway made consecutive 3-pointers late in the first quarter to help the Blue Dragons extend a lead they would not relinquish. “Overall, it was a good night for us,” Middletown coach Rob Smernoff said. “We did a good job early on. Some coaches on Senior Night worry about their team focusing on basketball, but we focused from the opening tip. The Blue Dragons (11-8 overall, 8-7 CCC) were given space to shoot from the perimeter and got hot early against the Panthers (4-14, 2-13). Five different Dragons provided offense, mostly from outside, with the second of Pettaway’s long-distance shots giving her team a 12-5 lead. Highsmith scored off a layup from a Dunn dish to push the lead to nine, and Dunn knocked down a 3-pointer as Middletown took a 17-9 lead after one quarter. And Smernoff was right again when he said the lead would have been larger if several in-and-out field-goal attempts went in. When Middletown went cold in the second quarter, the Blue Dragons tried to penetrate Platt’s 2-3 zone and got to the free-throw line. The Panthers cut their deficit to 19-15 on two free throws by Martha Chatman with 3:07 to go in the first half, but Mayo made four consecutive free throws, swished a 3-pointer on Middletown’s next trip down the floor, and then made a jumper with 1:38 left to put the Blue Dragons ahead 28-15. Mayo scored 12 of her team-high 15 points in the first half and Middletown led 30-17 at the break. Platt derailed any chance of a rally because of a slew of unforced errors. Middletown put the game out of reach at the midway point of the third quarter. Dunn hit two 3-point shots, Mayo hit another, and a jumper from Highsmith increased its lead to 18 points, 41-23. A good look at the future came on Middletown’s next possession. With freshman guard Shadae Bushay leading the fast break, Mayo found her in stride for a layup. Chatman hit a jump shot on Platt’s ensuing trip down the floor, but junior guard DeZiar Rose-Daniels nailed a 3-pointer 30 seconds later to give Middletown its biggest lead of the night, 46-27 with 1:13 left in the third. Bushay, who has been battling a foot injury, started and contributed at both ends of the floor. She finished with seven points. “She was (favoring) her foot the last few games, but tonight she was totally under control,” Smernoff said. Chatman led Platt with 16 points and Jalexia West added 11. Middletown has won three straight at the right time after starting the season winning seven of its first 10 and has already qualified for the Class L tournament. The Blue Dragons will have to be at their best against Berlin — the Redcoats (14-4 entering Thursday’s game against Maloney) have the CCC’s second-best record and beat Middletown by eight in January. Jayleena Gordils 1 2 5; Martha Chatman 6 4 16; Julia Misner 2 4 8; Jalexia West 3 5 11; Aaliyah Burnley 0 0 0. Totals: 12 15 40. Dominique Highsmith 2 3 7; Kya Mayo 4 5 15; Mackenzie Dunn 4 0 11; Ayanna McCalla 0 0 0; Shadae Bushay 3 0 6; India Weston 1 0 2; Tyah Pettaway 3 0 6; Deiar Rose-Daniels 2 0 5. Totals: 18 8 52. 3-pointers: P—Gordils; M-Dunn 3, Pettaway 2, Mayo 2, Rose-Daniels.